In a small skillet over medium-low heat, cook pancetta, stirring occasionally, until crisped and browned, 8 to 10 minutes. Remove pancetta with a slotted spoon; set pancetta and skillet with pancetta fat aside. Meanwhile, in a large bowl, whisk buttermilk, butter, and egg. In a medium bowl, whisk flour, baking powder, baking soda, and salt. Add flour mixture to buttermilk mixture, stirring just until incorporated. Gently stir in mozzarella, Dry Jack, if using, basil, and pancetta. Brush waffle iron with reserved pancetta fat or melted butter. Cook waffles in batches according to waffle iron manufacturer’s instructions until golden brown. (Cover finished waffles to keep warm or keep warm on a baking sheet in a 250°F oven). 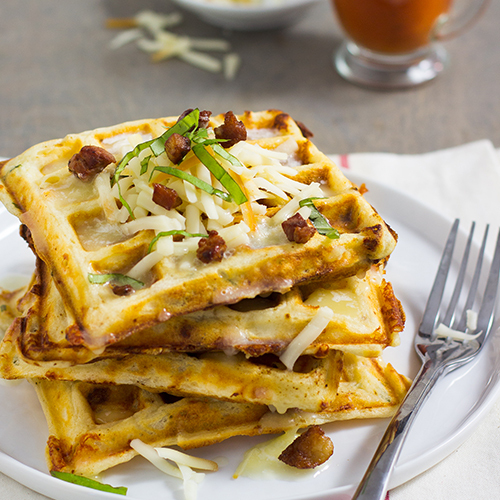 Serve waffles hot, topped with butter, cheese, marinara, and/or basil. Makes six 4x4-inch waffles.